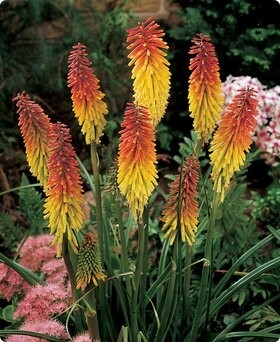 Tritoma uvaria-Red-Hot Poker Plant-also named Kniphofia Aloides, the Red Hot Poker, Flame Flower, or Poker Plant is an evergreen perennial growing to 4 feet tall by 2 feet. It is native to South Africa. It developes upright clusters of many tubular flowers, 1 to 2 inches long, borne on tall stems that look like pokers. The leafless stems which arise from a rhizomatous plant, from August to September. It flowers from the bottom upward, and the bright orange flowers fade to yellowish green as they senesce, resulting in a two toned spike with orange flowers at the top and yellowish ones below. The flowers are hermaphrodite, they have both male and female organs. It is in leaf all year. Leaves in basal rosette, linear, grasslike, to 40 cm long, 2 cm broad, partially folded, appearing entire but with minute, sharp teeth along the margins.